You look at the clock and know what time it is. It’s mid-afternoon and before you know it you will be doing something about supper. It’s been a hard day and the idea of standing over a stove is not appealing. You are simply not in the mood to cook. Dining out is not an option and take-out doesn’t cut it either. What to do then? It’s simple. Make a roast beef rice noodle salad. There is no cooking involved with this salad. Soak rice noodles in hot water until they are softened. Chop up veggies, slice an apple, whisk the dressing, tear apart sliced roast beef, and with a toss or two it is done in less than 30 minutes. 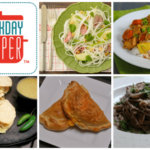 You have an Asian-inspired dish loaded with snow peas, tart apple, deli-sliced roast beef, green onions, and peanuts. The dressing is made with oil, rice vinegar, lime juice, garlic, and ginger. How often do you cook during the week? I aim for at least five times. 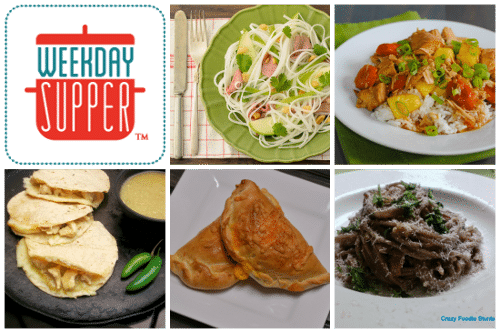 I’ve shared a few other Weekday Supper recipes too. Take a look at Calypso Pork Chops and Shrimp Fra Diavolo. Try cooking different recipes. It’s a fun adventure. You never know when you will find a new favorite. 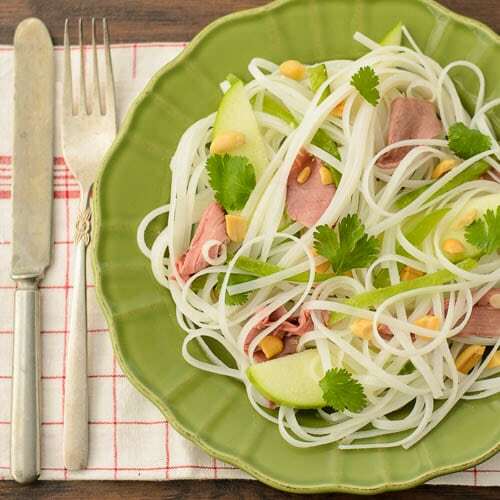 No cooking required for this easy noodle salad with deli-sliced roast beef, crunchy green apple, crisp snow peas, roasted peanuts, and dressed with lime, ginger, and garlic. Cover the noodles with hot water in a large bowl. Let soak until tender (al dente), about 10 minutes. Drain and return to the bowl. Whisk together oil, vinegar, lime juice, honey, ginger, garlic, and salt in a small bowl until combined to make the dressing. Add the dressing to the noodles and toss to coat the noodles. Add apple slices, peas, jalapeno to the noodles and gently toss to combine. Tear the beef into bite-sized pieces and fold into the noodles. Sprinkle cocktail peanuts on top. Garnish with fresh cilantro. A recipe for a roast beef rice noodle salad. It is made with deli-sliced beef, rice noodles, snow peas, tart apple slices, and tossed with a simple homemade dressing. Recipe adapted from one in the the Womans Day magazine August 2013 edition. Almost — ALMOST — too pretty to eat! Almost, however I managed to eat it and enjoyed every single bite. This salad looks amazing… I’m thinking of making it with leftover turkey tomorrow. Beautiful photos! Thanks Isabel and what a great idea to use leftover turkey for this salad. This is such a great idea. Happy Thanksgiving! Thank you DB and I hope you had a wonderful Thanksgiving. Rice noodles are the perfect thing for quick meals – I love them! Would love to have a big batch of this for lunches throughout the week. Thanks Lori and I had it for lunch for a few days too. Great idea for a quick lunch, Renee. 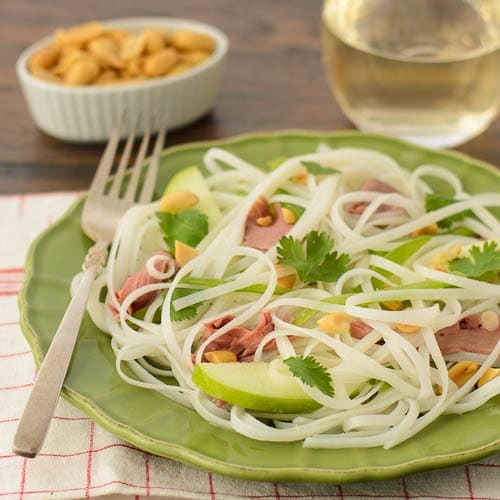 I love rice noodles and this is such a simple and healthy salad. Definitely gonna try this one! Thanks Bill. It does come together quickly and quite healthy. I’ve had it for lunch often. I can’t seem to get enough of it. LOVE this idea. I’m about to have some leftover roast beef, so this will be on the leftover list. I’ve started to get extra deli roast beef just to add to salads. The possibilities are endless.